A new bus gate will be installed near Aberdeen University after a consultation ended with no objections. Proposals to create the gate at College Bounds, by High Street in Old Aberdeen, were first mooted by the Old Aberdeen Community Council of 2018. It was hoped that the police-controlled bus gate could be handed over to the city council, in a bid to improve safety in the area, which is pedestrianised. Now it has emerged that there have been no objections to the scheme and so it can be built without committee approval. It is expected to be in place by the end of April with motorists breaching the rules handed a fine. 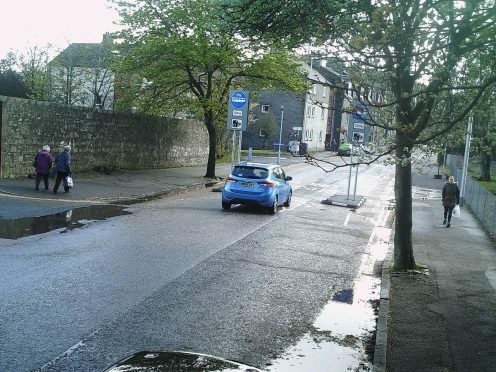 Tillyrdrone, Seaton and Old Aberdeen councillor Alex McLellan welcomed the move which should reduce the number of motorists travelling down the pedestrianised area. He said: “I’m glad the bus gate at College Bounds is progressing and is due to be installed in the coming months. This was called for by the community and I have pushed for this to be installed. It’s understood the bus gate will be temporarily policed by wardens with cameras and no permanent camera initially installed. Bus gates – usually short sections of road – are commonly blocked to all traffic except buses, cycles and taxis. They are in place in other parts of the city and have sometimes proved highly controversial. Since Broad Street was part-pedestrianised in August last year, penalties worth £156,600 have been handed out to motorists wrongly using the “shared space” area. More contentiously the bus gate on Bedford Road was the centre of a storm of protest when it was first installed in May 2016 to stop drivers using the street as a through road after the Diamond Bridge opened. It has led to the road being permanently closed between Meston Walk and Hermitage Avenue.